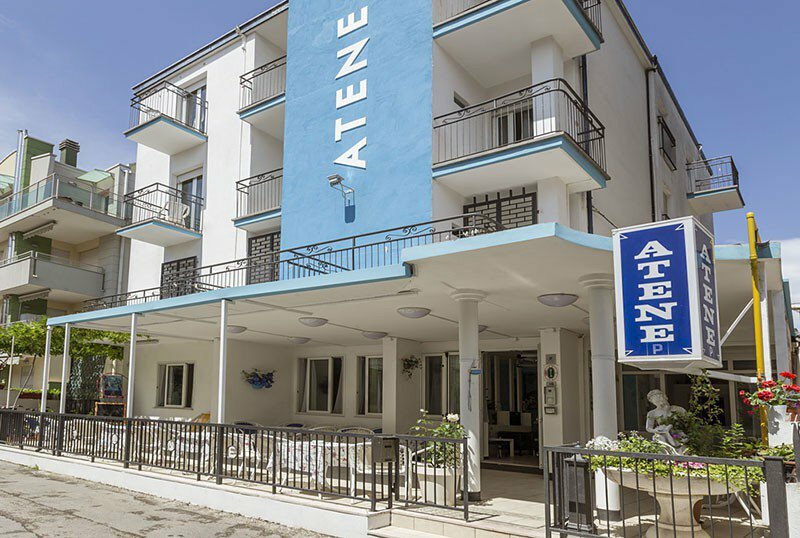 Hotel Athens is a welcoming family run hotel, conveniently located near the beach of Riccione and not far from the center. Ideal for families, offers services for children, playground area, free WI-FI throughout the entire hotel and accepts animals of all sizes. 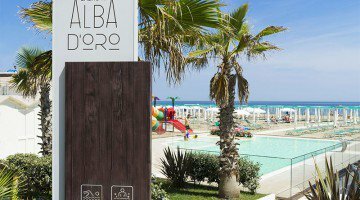 The hotel is located in a quiet area just a few steps from the beach of Riccione, the clubs of the Marano and the famous Viale Dante, full of shops and clubs. With a walk of 20 minutes you reach Viale Ceccarini and the center of Riccione. The rooms have a balcony, safe, digital terrestrial TV, WI-FI connection, private bathroom - with box or curtain - hairdryer and courtesy set. Air conditioning is available in the third-floor rooms on request. FAMILY: ample family solutions are available. Guests have access to a large equipped garden, free bicycles, a welcoming lobby with a bar and a living room. AIR CONDITIONING: on request, in the rooms located on the third floor. LUNCH AND DINNER: the kitchen is taken care of directly by the owners who offer the best tradition of Romagna with dishes of meat and fish every day. For lunch and dinner two choices of menu, vegetable buffet and water and draft wine always included. In the hotel: outdoor playground area and strollers on request. At the restaurant: high chairs at the table, dedicated menus and baby food. On the beach: playground, baby pool, entertainment and baby / mini / junior club. The beah affiliated with the hotel 117 Alba d'Oro is reached with a short walk, among the services offered: entertainment with activities for adults and children, swimming pool and Jacuzzi, children's playground area, beach volleyball court and beach tennis, bocce court, relaxation area, showers and cabins. Price list is per person per day for one min. of 3 days. Bottled water and wine with meals included. - Reductions are only applicable to children staying in room with 2 paying adults. - Discounts are not applicable during the high season (05-20 August). Children free 0-3 years old! Contact us for any custom quotes. Special promo from Easter to May 5, fixed price for overnight stay only € 20.00 per person per day ... children up to 10 years Free! Request your quote without obligation! The promotion starts from the beginning of the season until closing (with the exception of the peak season). The daily price to consider varies from one period to another according to the official price list, so contact us for a precise and personalized quote. The offer at the discretion of the management may undergo variations during the season.